Real Madrid employed a strategy very much akin to that of their city neighbours this evening. As at Anfield in midweek, they went with a 4-4-2, with both wide midfielders James and Isco tucked in very tightly alongside Kroos and Modric. This midfield four sat just in front of an equally narrow back four – a formation that had the dual effects of both preventing Barcelona from finding space in midfield and from threading through balls into the channels. The away side ended the game with zero successful through passes, as compared to an average of five per game this season. This strategy forced Barcelona wide in order to find space, an avenue that they mined fairly successfully in the first quarter – first through right winger Suarez’s cut back to Neymar, that allowed the Brazilian to cut in and open the scoring. Then, in the 23rd minute, after Sergio Busquets had foiled a counter-attack and played it out to Suarez on the right, the debuting Uruguayan’s cross should have been converted by Messi at point blank range. The surprising decision to give Suarez his first start on the right wing hurt the visitors defensively however. Neither he nor Neymar on the left were interested in tracking their full-backs and both Marcelo and Daniel Carvajal had free reign on their respective flanks at times. Marcelo in particular had a big offensive impact, ending the game with more chances created than any other player (four) and providing the cross that led to Pique’s penalty concession in the first half. Luis Enrique’s refusal to ensure that his side transitioned adequately from attack to defence eventually cost him. Sergio Busquets, as he often does, was providing a one-man barrier against the counter in the first half. But his hip injury was obviously still hampering him and as he tired in the second half, Madrid pounced. Their third goal came from a classic counter-attack, after an error from Iniesta on Madrid’s right touchline. Isco pounced, underhit his pass to Ronaldo, who went on to underhit his pass to James. James, however, saved the situation, with an inch-perfect through ball to Benzema, who was typically clinical with the finish. This was the consummate complete striker performance from the Frenchman, creating three chances, hitting the woodwork twice and, perhaps most impressively, completing 93% of his attempted passes – an usually high number for a front man. Madrid created four shots on goal in total from fast breaks, and in truth could have racked up a much higher margin of victory if the decision making in the final third had been better. Isco finished Wednesday night’s clash with Liverpool as the game’s top tackler and his defensive instincts were on show again today. As previously mentioned, Marcelo was at his unrestrained best/worst, running forward untracked at every opportunity. As he did in midweek, Isco dropped into a left back role to cover for his Brazilian teammate on numerous occasions. This kind of relationship between full back and wide midfielder is relatively rare in the modern game, but it ensured that Madrid weren’t overly exposed to Suarez runs into the channels. Shame Brazil didn’t have an Isco in their side when Marcelo had a positional nightmare in the World Cup semi-final this summer. 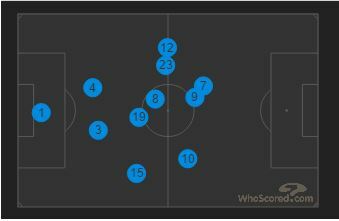 Observe the average positions of Marcelo (12) and Isco (23). The latter covered brilliantly for the former over the course of the game. Gareth Bale won’t like that! Barcelona were just as vulnerable from set-pieces as they were to the counter-attack. In other news, the sky is blue. Pepe had a free header from Kroos’ corner to put Madrid ahead, but the warning signs were already there in the first half – yet another free header from a corner, this time from Ronaldo, looked destined for the net, only to luckily rebound off the back of a Barca defender. New regime at Camp Nou, same old story.